Today was the day that I simmered most of the turkey carcass. I froze the roasted legs, separately, for making soup, sometime next month. Perfect storm re tonight's dinner. I found mushrooms on markdown today. I have some thawed eggs in the fridge that need using. I baked 2 large acorn squash yesterday, and can quickly mash them, then reheat in the microwave. Dinner should be a quick one to throw together. An easy dinner is in the plans for tonight. I've had a busy few days, and I just need easy. Only 2 will be home for dinner tonight. My daughter has her directing debut this evening, and I want to be there to support her in this. So, I'll meet up with the other daughter and we'll use a coupon to get a free sandwich to share for our dinner. I told the daughter, who's directing a one-act play tonight, that I'd bring something for her to eat in the car on the long drive home. That just leaves my husband and son for whom to make dinner. I've got leftovers from last night. I think that will work great. 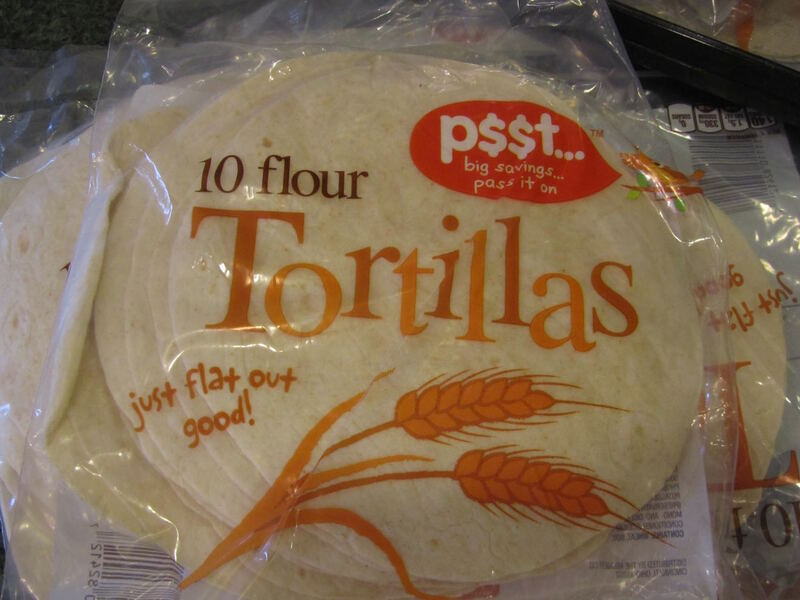 Fred Meyer carries one of their store-brand flour tortillas for 99 cents/1-lb package (10 tortillas). On Senior Discount Tuesdays, I get these tortillas for 89 cents a package. The catch is they are often out of these tortillas by the time I get there. So, when I find any, I buy whatever they have. I bought 3 packages this past week. That's only $1.50 for the main dish (1 each, and I make some larger, some smaller, depending on who is eating them), on a busy night, for the family. If I add a can of corn and carrot sticks, my total cost for the meal is right around $2. That's pretty good for a quick and easy dinner. How about you? What was on your menu this past week? Do you have any favorite ways that you use leftovers from Thanksgiving? or do you do, as my family did this last week, and just serve them, as is? Is anyone planning to do something to celebrate the holiday season, this weekend? I'm going to an Advent musical production at our church, on Sunday evening. On Saturday, I will get out the holiday decorations, with the help of my kids. If the weather is good, I have one lone, tree-shaped shrub by the kitchen door, on which I wish to put lights. I made birdseed ornaments, yesterday afternoon. They need to dry, still. Once they are dried thoroughly, I'll hang them on this shrub, with red and white twine. I have this look in my mind, of how I want this to look. White lights, birdseed ornaments, red and white twine, and red ribbons. I believe that I have everything that I need, here, already. All good menus and my family would be happy eating any one or all of them! We were out to family and friends for Thurs. and Fri. though I did bring something to each and took home leftovers too. So on Saturday, it was a no-cook day for me all day. The kids could just pick and choose what they wanted. By Sunday we were almost out of leftovers so I did a pork roast and scalloped potatoes with the remaining leftovers. Monday we were childless again but we had leftovers from Sunday so we worked through those and a couple of days I had chili dogs and I threw in a frozen pizza. My hubby also got his hamburger macaroni. The whole week was kind of mixed up trying to make things from the freezer but I was busy so many days that it was a quick-this and a quick-that. Last night I did make brined chicken pieces and roasted a butternut squash. Tonight will be up in the air but it will be home made. There will be no groceries to get this weekend. Hubby took care of that yesterday and the list only had cat food on it but he came home with a lot of discounted things like 1/2 and 1/2, yogurt, pork steak, buttermilk and more but the prices were super marked down. Hmm, hamburger macaroni sounds good. Do you put tomatoes in it? Or is it a cheese and macaroni sort of thing with beef? I have a surplus of macaroni, now, and this sound good. I hope you have a restful weekend, Alice! I was hoping nobody would ask! It is kind of a Dutch Depression era meal. Fry up some hamburger with onions. We season with salt and pepper and a shake of cumin and then drain well but don't rinse with water. Boil some macaroni and drain that well. Mix them altogether and that is the meal although my husband's family served that with ketchup and peanut butter. It really is good with one or the other and even both. It sounds strange but it is my hubby's favorite meal. I like it with any combination but depression era meals were how I grew up (not that I was part of the depression but my parents were so simple meals were served to us as children). I guess that living during a time like that never allows you to be wasteful. I had just a small serving of turkey on Thanksgiving day, and no leftovers this year. We didn't buy turkeys for our freezer either. I think beans has replaced any desire for meats. Cheaper, easier and hopefully a good enough protein source. We eat dairy so I'm not too worried. Going without a dishwasher (or hot tap water) for a few days made me remember how easy cleaning is when cooking vegetarian meals, as opposed to meat. So, your bean meals is easier in that regard, too. I'm glad you got a small serving of turkey on Thanksgiving, though. Have a great day, YHF! We had an Advent soup supper at church on Wednesday. It's always nice not to have to worry about making dinner for my crew. The next 2 Wednesdays will be the same. Our family is on clean up detail for these dinners. The big kids help with the cleaning and the little kids run around with all the other littles. It's a nice break from routine for all of us. Tonight we will help decorate the Christmas tree with Chrismons at church. It's a mother/daughter decorating party, so it should be nice. I have a Christmas project I would like to get done, namely the making of some antiphon ornaments. I had hoped to get these done during the summer and now we're already a week into Advent. I picked up some .97/lb. pork sirloin roasts on special today & plan to make them into pulled pork in the Nesco roaster tomorrow. That should make for an easy dinner. What a fun idea that your church does, a mother/daughter tree decorating party. I hope you and your daughters enjoyed it! Have a lovely day, Melissa! I hope your daughter's directing experience goes well! What a fun evening! We went to my son's jazz band concert at Barnes and Noble tonight--took my mom--then came back here for turkey stew and a quick bread (with whole wheat and oatmeal) meal (fresh pineapple for dessert! Hooray for Aldi!). I've been gradually putting up decorations all week. Tonight we decorated the tree. Sometimes I don't feel like going to all the work, but it is pretty when it's done. Your decorations sound fun! The evening was super fun. This was for my daughter's directing class. There are 8 students and they each directed a one-act comedy. Your evening at your son's jazz band concert sounds equally fun. And how very nice that you could take your mom. Having her so close is providing so many opportunities for her to really get to know your kids. Most of my Christmas decorations are of the "get them out and plop them down" variety. So the work is minimal, thankfully. Doing the tree is always so much work, but in the end everyone seems to enjoy it. And now, just think, you can sit back and just enjoy having yours done for the rest of the month. I hope your day is off to a wonderful start, Kris! The Thanksgiving turkey leftovers were eaten "as is" once by all, and another time by some of us. The rest were then transformed into other dishes. After making turkey stock, on Monday we had Italian Wedding Soup using turkey and turkey stock rather than chicken and chicken stock. Tuesday, we had a Cheesy Broccoli Rice and Chicken bake subbing turkey and using homemade cream of mushroom soup I Had made and frozen when mushrooms were on sale. Wednesday's meal was eaten at church, and Thursday we had baked chicken legs courtesy of half-price family packs of legs at Aldi (bought more to freeze as well)--$1.70-$1.75 for a pack with 13-14 legs--just right for my family of 7! Friday was date night for mom and dad with the kids having tortilla pizzas. Oh, and our church's Christmas Dinner will be tomorrow night. It's catered this year, and the sign-up list for desserts was full by the time I saw it, so I am off easy for tomorrow not needing to take a thing! Your meals sound yummy, and easy! I've never frozen homemade cream of mushroom soup. I do freeze cooked mushrooms, though, when I find the fresh ones marked down. And they freeze just fine for adding to casseroles, later. They also keep way longer than the sell-by date would indicate. So when I find a bunch of boxes on markdown, I buy several, and continue using them, fresh for up to a week past the sell-by date. In cooking, they do just fine. Besides the meal, does your church do any sort of activity when they have the Christmas Dinner? That sounds like such a lovely get-together. We had Ward's family over last weekend to see our new house and served sandwiches and soup that Theo made. We've been eating leftovers from that all week with just adding a few things here and there. Did your daughter get to chose which play she directed? That's pretty exciting and I hope all went well. When I was in high school, the older Thespians directed the different classes in one act plays a competition. We really had no idea what we were doing but it was a lot of fun anyway. Yes, each director chose their own play, and chose their cast. There were 8 students in this class, so it was a full night of entertainment. Very fun to see what all of the students were working on. And what did everyone think of your new house? How wonderful that Theo made the meal. Are you enjoying having him under your roof, again? I know you're still very busy getting your old house ready for market, but I hope you have plenty of down-time this month, to just enjoy the holiday season.